This brilliant flash of insight came to me when I got my last "Friends of Old Bulbs Gazette" e-mail from Old House Gardens. I got to know this heirloom bulb company last year after I went to Holland and became interested in the old Dutch tulips that were still being cultivated at the Hortus Bulborum in Limmen. Some of these bulbs have been around for 400 years, and they'd probably vanish entirely if a group of very dedicated, and mostly quite elderly, volunteers didn't keep them going year after year. One of the reasons why these tulips aren't more widely available is that some of them are diseased -- sort of. In the late 16th and 17th centuries, Holland's tulip mania was fueled by a desire for tulips with wild streaks of color on their petals. These streaked tulips were almost impossible to propagate, and the very randomness of the color variation drove speculators to gamble enormous sums on a single bulb. What the Dutch didn't know at the time was that the streaks of color were caused by a fairly harmless virus called "tulip breaking virus." It's spread by aphids and infects tulips and lilies (with less pleasing results in the lilies). So I returned from Holland with a craving for weird old tulips, and Old House Gardens was the only company that could help. The owner, Scott Kunst, has been growing and selling antique bulbs out of his Queen Anne house in Ann Arbor since 1993. Among their offerings I found "Exquisite Rarities from the Hortus Bulborum," a collection of bulbs that came directly from the hands of the aforementioned elderly Dutch volunteers. They cost a small fortune, but I had to have a few. I called Kunst to ask him about the alleged virus in these bulbs. "Yeah, it freaks out our customers and sometimes it freaks us out, too," he said. "But I try to explain that it's a kind of benign virus, like the naturally occurring bacteria that improve wine or cheese. This is just a virus that causes the pigments to clump together and reveal the naturally white or yellow color of the petals underneath." So why grow a diseased old tulip when there are perfectly new, squeaky clean tulips on the market every year? "You can grow what they call `modern Rembrandts,' which look similar, but they're modern hybrids," he told me. "The coloring is very crude and harsh, like a paint-by-number painting. 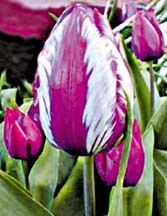 In true broken tulips, you'll see more refined feathering patterns, more damask-like. These modern hybrids totally lack the grace and beauty of the old tulips," he said. Old tulips aren't their only offerings; they also sell any number of spring and fall-blooming bulbs. For instance, you can find two rare and well-loved hybrid lilies developed by Leslie Woodriff, who bred lilies in McKinleyville for many years. They offer both `Black Beauty,' an astonishing lily that grows 5 to 8 feet tall and produces up to 40 ruby blooms, and `White Henryi,' which produces flowers with creamy white petals and a butterscotch throat with nutmeg freckles. I didn't come up with that description myself -- that's actually how Kunst described it to me. This guy knows how to sell lilies. Of course, the tulips and lilies aren't shipped until fall, but many of these rare bulbs are available in such small quantities that you're better off placing your orders this summer. There's something so daring and decadent about buying something old and rare and costly and just sticking it in the dirt. What if a gopher gets it? What if the snails mow it down? What if it gets lost in a sea of geranium or a drift of love-in-a-mist? On the other hand, these bulbs have survived the hit-or-miss attention of generations of gardeners before me. They might just make it in my garden, too. To feed your habit, visit www.oldhousegardens .com or call 734-995-1486 and ask for a catalog. And yes, they will send you an e-mail once a month if you so desire, and from that newsletter you will learn about a traveling exhibit of old flower pots that is not, as far as I can tell, coming to the West Coast (see www.aplacetotakeroot.com), an article on heirloom daffodils in Oklahoma that may date back to the Trail of Tears, and a list of any number of obscure old bulbs that you probably never knew you needed.